With the growth of massage therapy comes an even greater growth in the number of massage schools. Schools that specialize in other subjects have found that it’s easy to add a massage therapy program to capitalize on this growing demand. However, all massage schools are not the same. Where you go to massage school matters, and you need to choose carefully to make sure you go to a quality school. Massage school represents a significant investment of your time, energy and money, and you want to invest wisely. In order to find the best school for you, do your homework and ask questions. Research and review massage therapy schools and programs. Do they specialize only in massage therapy or it is just one of several programs they offer in school? Does it matter to you? Collect information about several programs—attend open houses or orientations, interview former and current students, read catalogues or audit a class. Consider your career intentions—determine which program most closely matches your personality, schedule, and budget. Review the curriculum to make sure that the style(s) of massage taught match what you want to learn. Meet with an admissions counselor. Be aware of time requirements for a particular program. Make sure your other obligations will allow enough time to study and practice outside of class. Take time to get to know the credentials and experience of the faculty. Request information about student services—post-graduate job placement, tutoring, continuing education, and financial aid. Consider tuition, fees, any other costs, the availability of financial aid, and the quality of the program. Remember to budget for additional necessities, such as a massage table, books, and supplies. 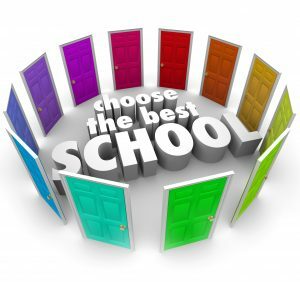 National accreditation should be a big factor in your decision about where to go to school. The United States Department of Education recognizes a number of accreditation bodies that evaluate schools and accredit them. You don’t want to go to a massage school that is not accredited. National accreditation is essential because it allows a massage school to offer federal financial aid to qualified applicants. If paying for massage school is an issue for you, be sure to choose a school that offers federal financial aid to those who qualify. Accreditation is also important in case you plan to move to another state. Massage state boards are more inclined to accept transcripts from accredited programs than those that are not accredited. If you’re looking for a massage therapy school in the Las Vegas area, schedule an appointment with our admissions department to discover how our industry-leading curriculum offers a specialized approach to massage therapy education. Our program includes the advanced techniques necessary to succeed in the massage therapy industry of today and tomorrow! More importantly, our passion and believe in the benefits of massage therapy will inspire you to become a passionate and caring healthcare provider in this very rewarding career.